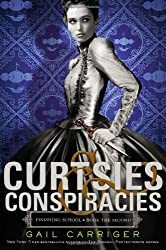 This is the second book in the Finishing School series, but the seventh book I’ve read from Carriger’s steampunk and urban fantasy world. As usual, I continue to like Carriger’s diction, silly dialogue, and her unique fantasy world. I am not enamoured with Sophonria anymore than I was with Alexia, but I like the ensemble cast. I really adored three characters from the Parasol Protectorate series and none of them appeared in this series until this novel! My favourite Lord Akeldama finally showed up. Not enough page for the most fabulous vampire in fiction, but I’ll take it. I hope this means he’ll show up more in these books. My main criticism of this novel was that they introduced a love triangle which seems silly since Soap is clearly the end game for the heroine. I like the rake Lord Mersey, but why tease it out? He’s clearly not to going to get the the girl, but I wouldn’t mind if he does. I like Soap and Mersey for different reasons. It is silly because the heroine is 15 and not very romantic. The third of this series comes out in November so hopefully the plot and characters move even further along. I am looking forward to the Prudence/Custard series next year too. Read July 4-5 on Kindle.